Method Feeders, In-Line Feeders, Scoop Feeders, Moulds and Feeder Bombs for use with ground bait, method mix and paste baits. Vituallay indestructacble, made from durable metal alloy. Fill with groundbait or paste. This is a fish safe in-line version of the Feeder Bombs. 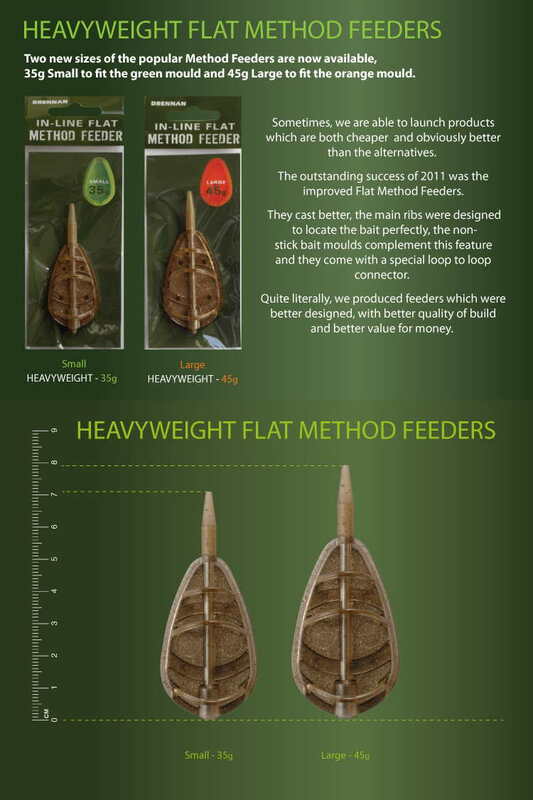 In-Line Flat Method Feeders are highly effective and fish safe. With this design of method feeder, both the lead in the flat base and the bait load distribute the weight into an aerodynamic bomb shape. Click to watch a video on this product. The special slim-line connector is ideal for loop to loop attachment. It allows quick change of both hook links and feeders, and has a breaking strain of 36lb (16kg). ESP's Mega Method Feeders can accommodate as much bait as the popular sizes of PVA bag but by using the accompanying mould, are much quicker and easier than filling and tying up a bag. Click here for more information and to watch a movie on this product.